As mentioned in previous posts, Mary Elizabeth Lee, daughter of William D. “Bill” Lee and Mollie Bell Clements of Ray City, married Saunto Richard Sollami. The Sollamis made their home in Thomasville, GA.
Mary Lee Sollami died December 1, 1993 in Thomas County, GA. Saunto Richard Sollami died December 6, 2003. The are both interred at Ray City in Beaver Dam Cemetery, in the Lee family plot. Also buried at Beaver Dam is their infant son, born January 3, 1945. 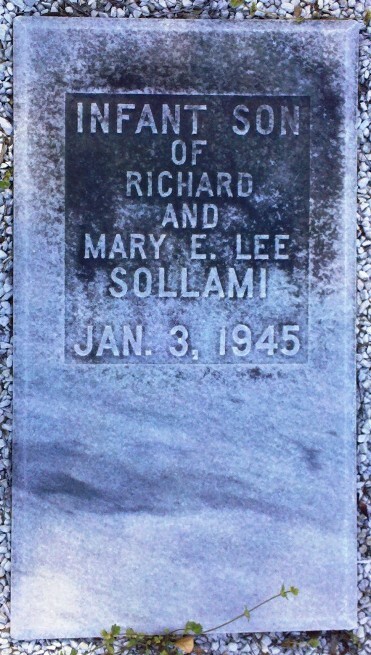 Gravemarker of Mary Lee Sollami (1915 -1993), Beaver Dam Cemetery, Ray City, GA. In memory of Saunto Richard Sollami (1919-2003), Beaver Dam Cemetery, Ray City, GA. Infant son of Richard and Mary E. Lee Sollami, Jan 3, 1945. Beaver Dam Cemetery, Ray City, GA.